With the final game of the World Club Series being in St Helens on the Sunday evening that was a game I just couldn’t make, far too long a journey to make it home at a reasonable time! However one of my teams London Broncos were playing in Doncaster! Now, I didn’t really know how far from home that was, but looking at the map it was sort of on my way home! The fact that Doncaster were playing Featherstone Rovers at the same stadium made it a total no brainer for me! After a good breakfast in my hotel I got on the road – The M62 took me to the right side of the country. I went through Winter basically! Driving snow, strong winds – not so much fun on the highest motorway in England. It never ceases to amaze me that people don’t feel the need to slow down in such awful conditions. However idiots aside I arrived at the stadium in good time and in one piece. Doncaster play at the Keepmoat Stadium – they share with the football club and for this season at least the Sheffield Eagles. The stadium is a very impressive one, I imagine probably one of the best in the league. The seating was of the pick your own variety so I took myself to the back of the stand in an effort to get a warmer spot and settled in my very comfy padded seat. As always fans from both teams were sitting together, it felt like Featherstone had greater numbers. The teams emerged and I spotted 2 ex London Broncos – Will Sharp and Paul Sykes and also Paul Wood of the famous Challenge Cup Final incident. It took me a lot longer to recognise Paul Cooke in a Doncaster shirt. In his day Paul was one of the best players in Superleague, an imposing figure he often controlled the game. Featherstone have been a successful team in recent years, the league is going to prove to be a very challenging one for newcomers Bradford Bulls and London Broncos. It feels like a tougher brand of league is played outside of the top level. Doncaster took an early lead after Featherstone seemed to ignore the ball as it was kicked through. The lucky recipient of what was a gift of a try was Danny Cowling. That man Cooke had put a grubber kick in, he is well known for that, but not by Featherstone it seems! The conversion was kicked very low and missed the posts . The rest of the half remained scoreless, which is pretty unusual in this game. The Doncaster defence was tested by Rovers but they held them out. That must have been of great satisfaction to the home team as they’d shipped points against London Broncos in the 1st half of their game the week before. However once the teams had returned for the 2nd half it didn’t take Rovers long to score, another grubber kick this time from Jy Hitchcock was pounced on by Nathan Chappell. 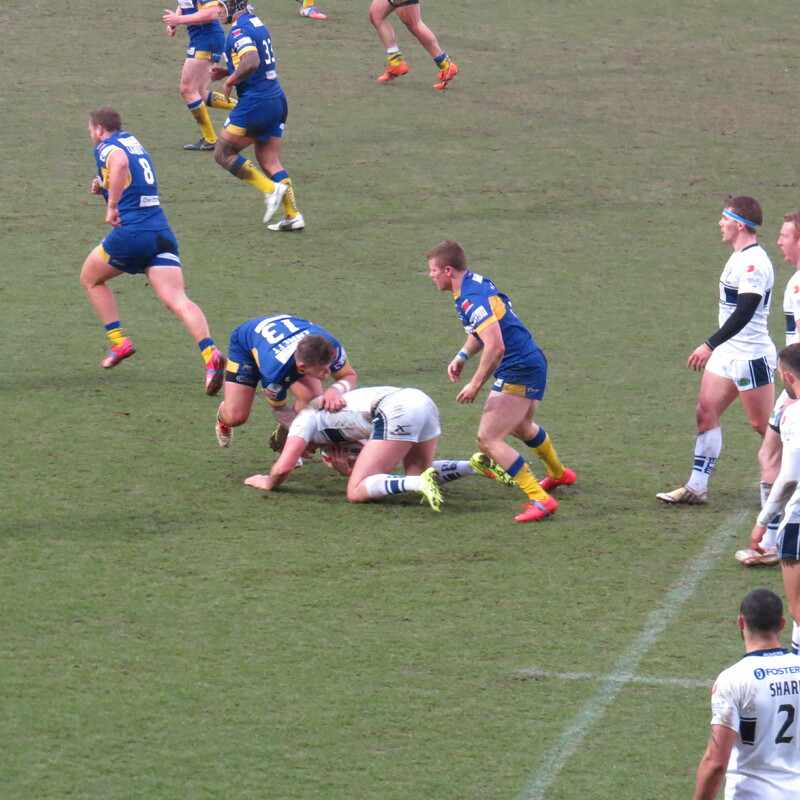 The scores remained even as the conversion was missed. Paul Sykes edged his team ahead with a penalty kick a few minutes later, that penalty was traded with a score from Stu Sanderson 10 minutes later. Back to all even on 6 apiece. Cooke came to my attention at this point – no idea how I didn’t spot him before – he is a bit of a once off in the game – very tall, and maybe with a few extra pies eaten. He tried his very best to get his team ahead, but to no avail. It was to be Featherstone who took the points home with them after Dan Ryan scored their 2nd try after Jy Hitchcock had evaded several tacklers. 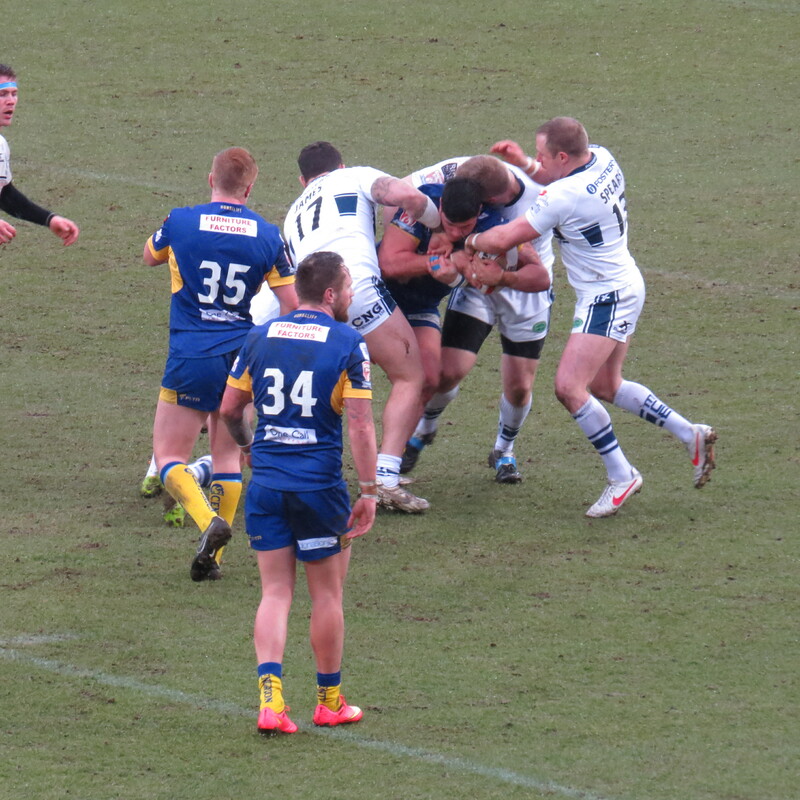 The try was converted to take the final score to Doncaster 6 Featherstone Rovers 13. There had been a lot of one man rugby being played by Rovers in the 2nd half, once they decided to pass they scored – maybe a tip to take for the next game. One man up the middle just won’t do the job. I was made to feel very welcome and spoke to lots of lovely, rugby mad people, that was really the best part of the day. 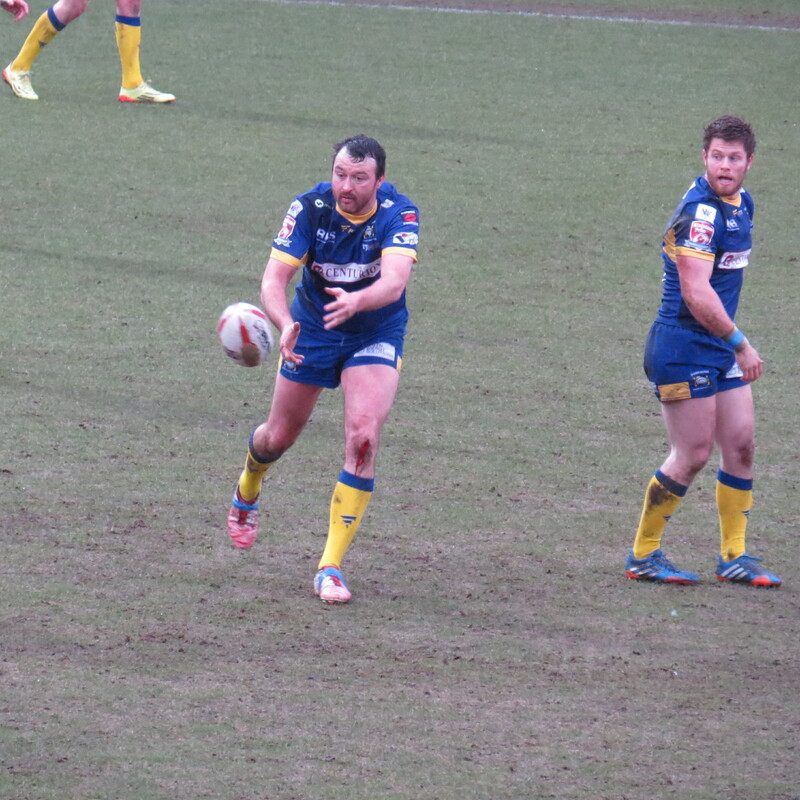 Best moment of the game – not so much in the action – but it was good to see Will Sharp and Paul Sykes playing.